The PF400 is a friction feeder with high-speed and high-accuracy placement, using the latest Servomotor Drive technology. It suits wrapped and unwrapped leaflets, cards, coupons, CDs, and most other flat paper or plastic items. Our automatic paper feeding mechanism adheres to Australian standards to ensure that all operators who control the machine are safe. 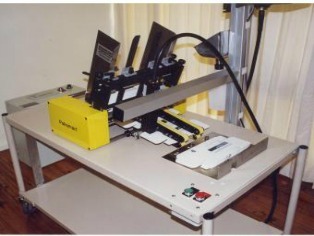 The machine uses the finest materials in the packaging industry to ensure that businesses produce top-quality products. Used by the food and beverage industry, carton manufacturers, contract packers, pharmaceutical industry and mailing industry, Australian made means we can truly customise the PF400′s size range, discharge system and program features to ensure complete customer satisfaction. The PF400 can be operated as a self-contained unit requiring no interfacing or linked to your packaging system for synchronised operation. 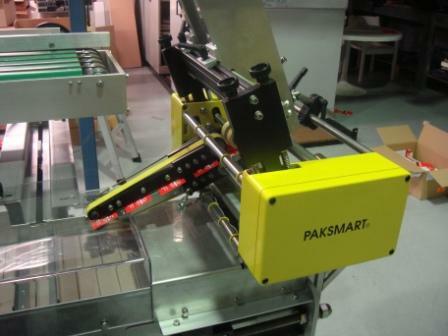 Since 1993, PakSmart Machinery has been manufacturing high-quality packaging machines that execute different packaging processes. Our personnel has extensive experience in designing, assessing, advising and implementing packaging solutions to meet the expectations of their customers. We help businesses reach their goals in packing their products. To know more about our wide range of packaging materials, call +61 2 9630 9464 or fill out our contact form.